Fibromyalgia is a chronic widespread pain condition that affects 3.3% of the Canadian population. It is difficult to treat as there is no one "magic bullet" like using penicillin for infections. Successful management identifies and addresses the 4 key root causes: Structural – Biochemical - Psychoemotional – Neurological. Emerging effective therapies in each area include STRUCTURAL treatment with Platelet Rich Plasma prolotherapy for weakened ligaments, Botox for muscle imbalances. BIOCHEMICAL optimization through Functional Medicine (correcting nutritional deficiencies such as vitamin D, omega 3 fatty acids and enhancing detoxification) and Bioidentical Hormone replacement therapies (including growth hormone). PSYCHO-EMOTIONAL mood, cognitive improvement with EEG biofeedback (neurotherapy), cognitive-behavioral therapy, spiritual counselling. Neuropathic pain (NEUROLOGICAL) control with IMS acupuncture, neuropathic pain medications (pregabalin, duloxetine, tramadol, pharmaceutical cannabinoids such as nabilone, sativex spray). To do this, an interdisciplinary team approach is required ... combining the best of conventional medicine with science-based complementary therapies. 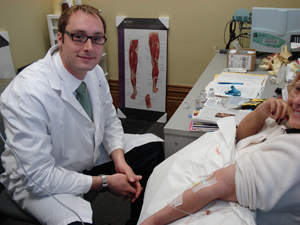 Naturopathic Doctor Leigh Arseneau ND doing intravenous therapies such as Myer's Cocktail (antioxidants) and Hydrogen Peroxide (anti-viral).